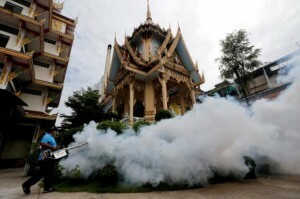 Thai health officials on Wednesday said 33 new Zika virus cases have been detected in the country as officials step up screening for groups at high risk from the disease such as pregnant women. “We confirmed 33 new cases last week and have detected the virus in two further provinces,” Ministry of Public Health spokesman Suwannachai Wattanayingcharoenchai told Reuters. Suwannachai said health campaigns warning travellers about Zika have been increased as many Thais flock to the capital Bangkok to take part in national mourning activities for King Bhumibol Adulyadej, who died on October 13. Thailand became the first country in Southeast Asia in September to confirm Zika-linked microcephaly, a condition that results in babies being born with small heads, and has one of the highest number of Zika cases in the region. Other parts of Southeast Asia have reported dozens of cases of Zika, including city state Singapore where 450 cases have been reported in 2016. Thailand has reported more than 680 cases of Zika since January but its Department of Disease Control has said the virus is manageable. In neighbouring Myanmar, a pregnant foreign woman was diagnosed with the mosquito-borne virus last month – the first case confirmed in the country. Zika infections in pregnant women have been shown to cause microcephaly – a severe birth defect in which the head and brain are undersized – as well as other brain abnormalities.